This educational video, produced by Moleculera Labs, provides insight into two perplexing neurological conditions ─ Pediatric Autoimmune Neuropsychiatric Disorder Associated with Streptococcal infection (PANDAS), and Pediatric Acute-onset Neuropsychiatric Syndrome (PANS). It is designed to explain PANS/PANDAS to a variety of audiences, both lay and professional. It is also helpful for young patients to better understand their illness and know that there is hope! A growing number of children and adolescents are believed to unknowingly suffer from PANS or PANDAS, treatable neuropsychiatric conditions that are characterized by a sudden onset of obsessive-compulsive behaviors (OCD), motor and/or vocal tics, anorexia and other neuropsychiatric presentations. All too often, PANS and PANDAS patients can be misdiagnosed as having a psychiatric illness, when the underlying origin is actually due to a misguided autoimmune response, triggered by certain bacterial and/or viral infections. In essence, the child is exposed to infection(s), such as strep, and develops, seemingly overnight, behavioral or personality changes. 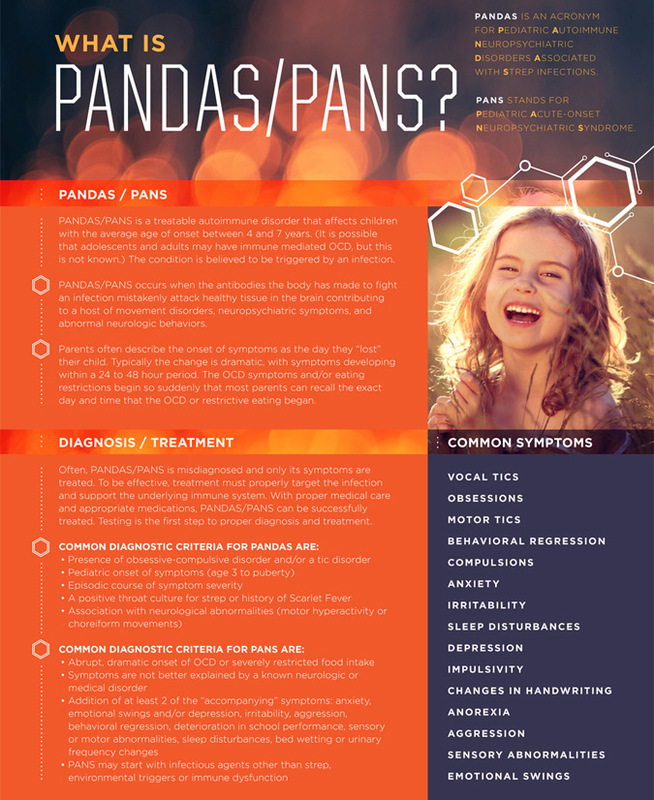 However, if diagnosed correctly, PANS and PANDAS can be treated and in many cases, patients can return to enjoying a symptom-free life. There are no tests that provide a definitive diagnosis of PANS and PANDAS. 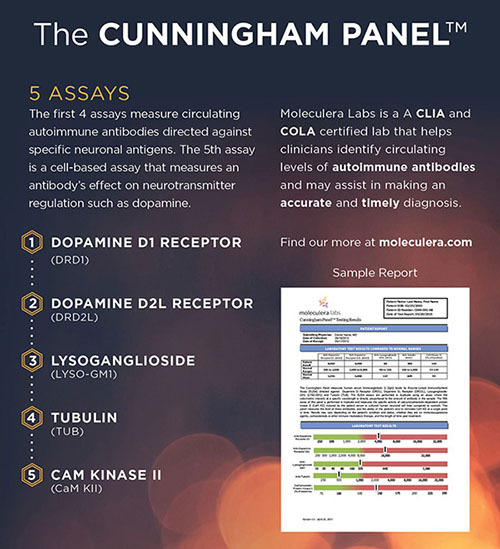 But after more than a decade of research, Moleculera Labs is offering the Cunningham Panel™, the first and only test that can assist physicians in diagnosing these conditions.